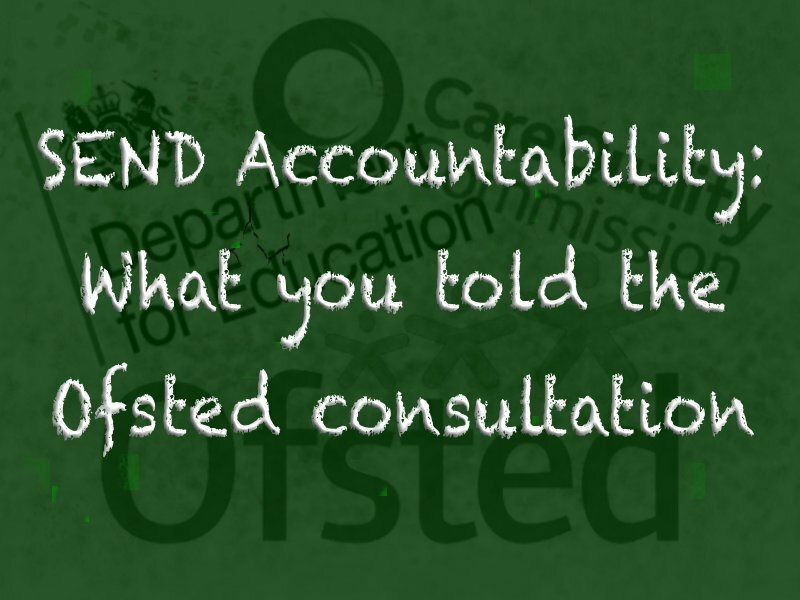 Late last week, Ofsted released its report on responses from parents, carers and practitioners - anyone with an interest - to the formal consultation on the proposed SEND Inspection Framework. The framework is due to be launched in May 2016 and for parents, it can't come a moment too soon. The planned accountability system will be operated by Ofsted for education and the Care Quality Commission for the health and social care aspects. They wanted to know what was important to families and the people who would be working within the system. SNJ put forward its own response. In addition to online responses, Ofsted and CQC held discussions with young people, their parents and carers, disability and special educational need support groups, local authorities and health groups about the most effective ways to inspect how well local areas are meeting their new duties. These discussions were instrumental in shaping the proposals in the consultation. Five pilot inspections were also carried out. I've summarised the points respondents made and below each set, the actions that Ofsted will take as a result. I would suggest you bookmark this post and ensure they do as promised! Timeliness of needs being identified. Quality of information provided to explain the assessment process and how well parents, families, children and young people were included in the process. The cooperation between schools, colleges, social care and health services during the identification and assessment process. The clarity of the deciding criteria for assessment for specific needs. SEND provision in schools and colleges. Some also wanted health and social care inspections to include those on SEN Support. How effectively LAs communicate so families so that parents and carers, children and young people understand how needs are identified and how decisions are reached. LAs engagement with parents, carers, children and young people, and their involvement in the strategic decision-making process as full partners. Inspectors will give particular emphasis to involvement in strategic joint commissioning and involvement in the assessment of their own case. LAs effectiveness in supporting children and young people with specific needs, where its performance is a particular strength or a cause for concern. How the local area takes account of children and young people’s wishes and feelings when making decisions. The progress that children and young people made towards the next stage of education or life should be evaluated based on their starting points, as well as their satisfaction at progress made. Respondents felt that ‘wider’ outcomes, in addition to academic achievement, should include aspects such as improved health and employability. This relates to the preparing for adulthood outcomes introduced by the SEND reforms: employment, independent living, good health, and community participation. Some respondents, particularly those from local authorities or sector groups, wanted more detail about how inspectors would measure outcomes. Parents agreed strongly that the support provided through the local area, and the impact of early diagnosis and intervention, should be evaluated. Review education, training, health and social care outcomes as well as academic outcomes, in providing a pathway to adulthood. Inspect how LAs processes, culture and ways of working add value to young peoples’ progress, taking account of their starting points. E.g, Continuing improvements to access to community facilities and local participation, such as through improvements to transportation. Review how SEND provision differs across the breadth of the area. Review how well the local offer fulfils its remit. Proposal 3: A wide range of information will be used to evaluate the effectiveness of local area arrangements in identifying children and young people who have special educational needs and/or disabilities; and in meeting their needs and improving their outcomes. First-hand evidence from parents, carers, children and young people should be the most important feedback for Inspectors. Inspectors should examine how well schools, other providers, and the local area meet their statutory obligations, ensure all staff were trained and knowledgeable and that children with SEND were safeguarded. Schools' impact should be evaluated. Some respondents wanted an evaluation of joint commissioning between education, health and social care to meet young people’s needs. They felt that evidence should be gathered from commissioners. assess how children and young people’s life chances, their well-being and opportunities are enhanced by the support and services they receive. This will include preparing for the next stage of their learning and/or their prospects of continuing on to higher education, employment or training and, where appropriate, independent living. Inspectors will use this evidence to evaluate the extent to which outcomes for children and young people are improving. include examination of case studies, relevant inspection reports, tribunal data and evidence of outcomes. look at how well health and social care involvement is identified in support plans, and how all of the agencies work together to assess needs and improve outcomes and the effectiveness of the support provided. will consider how well LAs understand the key strengths and issues in the local area such as dealing with any rural isolation and the number of young people educated or provided for out of the local area. Proposal 4: A wide range of ways will be used during the inspection to obtain the views of children and young people who have special educational needs and/or disabilities, and their parents and carers. Parents and young people should be a key source of feedback about how well needs were being met. Inspectors, rather than the local area or providers, should choose which parents and young people to speak to and the places to visit across the full age range. Children and young people on SEN Support and their parents and carers, should also be included. In addition, children and young people with SEND in independent schools who are funded by the local authority, those being educated at home or those whose parents have refused a school place, and their parents and carers should be also contacted. Inspectors should have the skills to be able to communicate with parents and young people, especially if alternative forms of communication were needed. This may, occasionally, mean using an interpreter, an advocate or assistive technology. Parent forums, support groups and other bodies who represent parents should be asked to contribute to inspection. Inspectors should have thorough knowledge, expertise and experience of special educational needs and disabilities, and of local authority arrangements and structures. There should be a parent (or a representative from a parent forum group), a health practitioner or someone from social care trained as an inspector on the inspection team. In accordance with the Code of Practice, parents and carers must play an essential role in the process. Inspectors will meet with groups of parents and carers that are representative of the local area. It will not always be possible to meet with parents on an individual basis, but we will ensure that parents have every opportunity to share their views with inspectors when we visit providers. We will use views of parents to inform our evaluation of the effectiveness of the local area and we will not identify children, young people or parents when we present our findings to the local area. We will invite the local area to recommend representative forums, parents and young people for us to meet with, but the decision ultimately rests with the inspection team. Inspectors will be recruited with a relevant professional background in special educational needs and disabilities. Inspectors will be specialists and will be well experienced in knowing how young people’s special educational needs and/or disabilities can be met. Where we need to, we will make arrangements to communicate with young people and adults through sign, symbols or other means. As a result of the consultation and the pilot inspections, Ofsted has decided to give five days’ notice before an inspection. This is so parents and young people have time to find childcare or other support to enable them to take part in the inspection. use appropriate means to gather young people’s views, for example, with those who use alternative means of communication, such as sign or symbols. The feedback will be taken into account when producing the framework and the handbook for inspections. Each area's full age range from birth to age 25, will be included, in line with the Code of Practice. Inspections will commence in May 2016. The development and effectiveness of local areas’ commissioning arrangements will be assessed. Inspectors will be rigorously trained and any inspectors formerly employed by local authorities won't be able to inspect their former areas to avoid any conflict of interest. An area's size and complexity will be taken into account and its believed that five days onsite inspections will be sufficient for inspectors to gather and analyse first-hand evidence to inspect the effectiveness of the local area. A pre-inspection analysis will enable the Inspectors to decide for themselves which groups of parents and carers to speak with, and the schools, colleges and other institutions to visit. As part of the inspection, a sample of schools and colleges will be visited to assess their SEND provision outside of their usual institutional inspection. For health and social care services, a local area’s effectiveness in meeting its duties under the Code of Practice will also assess their overall contribution and ability to work collaboratively. This spring and summer terms there will be a series of regional workshops to support local area planning, evaluation and understanding of the new inspection framework. During this time, the new SEND inspectors will be trained and the new local area SEND inspection handbooks will be published. Again, you can find the whole report here. Are you impressed with the results? Leave your views on the results and if you think the process will have the intended impact. I don’t see anything there about timeliness of completing EHCP process, or review of EHCP (still a nightmare, still not sticking to timescales, although they aren’t as a clear cut as completing it first time round)…….please please tell me that is something they are going to be held accountable for! Maybe this is included in it, I think we’ll need to wait for the Handbooks. I do note that they have only feedback on the things they are doing anything about, other than one item that was popular re a two step process on inspections which was turned down. Ofsted inspections? Really? What are parents going to do if their LA has a poor Ofsted report, move to a different county? The only way to make LAs comply properly with the law is to have financial sanctions of they fail to do so. It is the only thing they will listen to. Inspections are some of the answer, but won’t be all of it. The people working in my LA only look at the cost of anything, they don’t care about the children at all, so therefore it has to cost them more to do the wrong thing than it does to do the right thing. Sad but true. Thanks for this. I didn’t expect Ofsted to listen to the views of home educating parents of children with SEN and in expecting nothing I am not disappointed. “we will ensure that parents have every opportunity to share their views with inspectors when we visit providers…”[not relevant to home ed] + “We will invite the local area to recommend representative forums, parents and young people for us to meet with”. I guess there’s an outside chance that home ed parents could manage to attend Parent Carer Forums and give feedback that way. When Ofsted invite comment from parents and pupils and then ignore a serious safeguarding failure by a Cheshire East school, can they be held accountable? I have lost faith in Ofsted. There’s little point in giving “us” a voice and then sweeping the message under the carpet. Yes indeed. Thank you. You save us a lot of time and make it very clear. There needs to be equal accountability at school level with the CQC conducting more than cursory checks of SEN provision in mainstream schools. I am amassing lots of qualitative evidence for the forthcoming visit…whenever that may be! One think I remember them saying in the webinar was that if they get lots of complaints about a particular area, they may visit it sooner than was originally scheduled, so it’s worth making a noise if necessary, I think! Thanks for the tip Tania. Just amassing and completing reports on parent-carer events looking at Mental Health and SEND, SEND and xclusion in Hackney and the experience of Turkish speaking parents – I may send them in advance but not sure who to send them to. Can you find out about advance info so we can make sure it gets to the right place/person? I think again this is something that will be in the Handbooks – When it’s published we’ll bring you an update for sure! Do you know if they will look at the quality of transfers to EHC plans? It doesn’t say in the report – but I’m sure this is one of the things that parents can feedback on during an inspection – as well as face to face meetings with some parents and young people, everyone will be able to feed back online. That’s not an uncommon viewpoint. All I can say is that (s)he who gives up the fight first, loses. This, surely, is why we have Parent Carer Forums so that parents have ongoing strategic representation. On a personal level, when we feel we are defeated, it’s best to take the Scarlett O’Hara approach, “After all, tomorrow is another day.” Then get up and advocate for your own child all over again and never give up. I’m quite sure you do this already. Even though my boys are 18 and 16, I am still doing this, including today, making sure my husband goes with my younger son to the UCAS fair (I don’t have the physical stamina to walk round) and have prepared university hit-lists having already scoured all suitable courses at degree level as my son can’t organise himself to do this. It never ends and our children’s success so often depends on the work we do as parents to support them. You won’t let your child fail and neither will I, but those with SEND but without parents who can advocate for them have little hope, I fear. This is why our involvement is crucial at every stage.